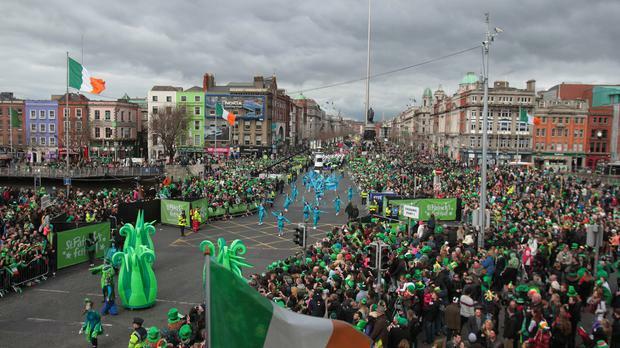 This weekend sees the ultimate global expression of paddywhackery, with Saint Patrick's Day more feted overseas than it is here. The nationally-approved nonsense celebrates our conversion to a religion that has arguably led to much suffering in this country, by a foreigner who was not an officially canonised saint, and is also credited with the remarkable feat of driving out creatures that weren't even here in the first place. Surely the pious man of the moment would have approved. Then again, Patrick seems to have been as much politician as priest, being savvy enough to recognise that the best way to infiltrate this island of powerful pagans was by starting at the top with the chieftains, who would then convert their clans through their influence. It certainly sounds easier than trying to persuade every Paddy he met to adapt a belief system originating in the Middle East. Especially as he would have had his work cut out, for we were more akin to the Native Americans - or natives, as many of them now prefer to be called - some of whom forked out to help us during the Famine. For in those distant days, we were wise enough to worship gods that directly impacted our lives, all of which were surely expressions of any almighty one. Such as the god of the sun that made our crops grow, or the god of the earth on which we live and to which we return. In hindsight, they seem more harmless and healthy than the one that Patrick was peddling; being that most dangerous deism of The One True God that has been a fatal preoccupation of too many people for too long. For proving your One True God is more truly the one than anyone else's has inspired killing instead of kindness, and slaughter in the name of spirituality. While it seems ironic that Patrick "knew not the true God" of his land of birth - either Scotland or Wales - until he was imprisoned in pagan Ireland. Once in Ireland, like many a homesick exile, he clung to what he previously scorned. Six years of slavery here familiarised him with the Irish clan system, with his former master, Milchu, reportedly one of his earliest conquests/converts. Did guilt for enslaving another soul lead that chieftain to choose Patrick's foreign god? Might we have been better off remaining loyal to the gods of our land? And left the lauding of so-called saints to those who romanticise "the old country", having hijacked the homeland of its pagan natives?